My Favorite Piece Of Patio Furniture! 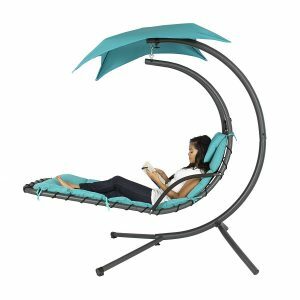 2 Helicopter Hammock Chairs You’re Gonna Want To Check Out! 5 Reasons You Should Seriously Consider Getting One! #5 Coz You’re A Bookworm Like Me! Now That You’ve Decided To Get One, Here’s 6 Things You Need To Consider Before Buying! 5 Simple Tips To Ensure Your Helicopter Swing Chair Lasts A Lifetime! #1 If It Rains, You Best Be Ready! #3 It’s A Swing, Not A Spaceship! #4 Retain All The Packaging! Washing & Cleaning—Should You Be Worried About Rust? Where Should I Buy Mine? I’ve Had My Say, Now It’s Your Turn! 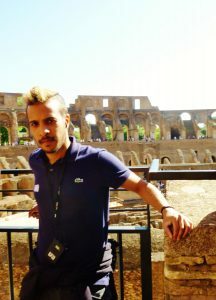 Summer time is the best. BBQ’s, patio time, outdoor sports (soccer and ultimate Frisbee), and my personal favorite…..wait for it…the smell of freshly cut grass! How can you not love the smell of freshly cut grass! While summer is my favorite time of the year, it does get pretty expensive. Have you noticed how there’s always some sort of new fad/gimmick every summer!? I’m talking trendy fashionable patio furniture, cool outdoor lighting, BBQ grills that grill and do 10 other things which I’ll probably never use! The list goes on and on. 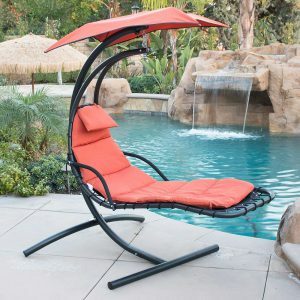 That being said, there are some really cool products that take summer lounging to a whole new level. A 21st century take on the old, boring, and yesteryear hammocks. If you’re rocking an old school hammock, now’s the time to upgrade to one of these bad boys. Not sure what to get? No worries, I could you get covered! 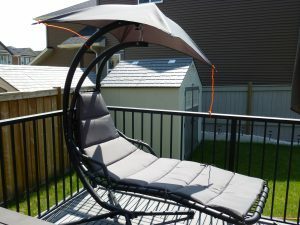 Scroll down to check out reviews of my 2 best helicopter hammock chairs! Let’s look at each one in greater detail! Affordable, stylish, and easy to assemble! It Comes In Different Colors! This chair comes in 3 different colors: green, teal, and red/orange. What would I pick? I’d go with a darker shade such as the red/orange. Darker shades “appear” less dirtier than lighter shades. 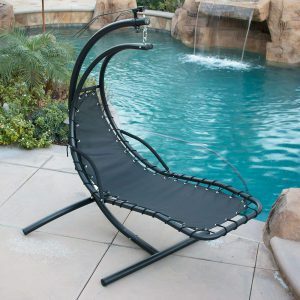 Weight rating is one of the first things you should consider prior to buying a helicopter lounge chair. That being said, this chair is rated for 265 lbs, which in my opinion is sufficient for most. Measuring up to 73” in length, 46” in width, and 78” in height, this is a relatively small unit compared to some of the other ones I’ve seen. Just like weight rating, you should pay close attention to dimensions before buying. The metal parts are all powder coated which is great. However, any small imperfection to the paint (chip, nick, or peel), and you’re likely to see rust formation. How do you deal with this? Apply a rust inhibitor like rust check. I address this in greater detail later in the post. Another awesome chair that’s slightly larger than the one discussed above! If you do plan on using this indoor, you may wanna remove the umbrella. I know I would! That being said, it’s nice to have this feature in case you ever do need it. Definitely a big deal if the chair is going to be left indoors. Rubber feet on the legs basically ensure your floor is better protected from scratches. A Little Pricey For My Liking! Compared to the chair discussed in #1, this is slightly more expensive. Considering both products are quite similar, I definitely think they should have a similar price point, which unfortunately they don’t. It’s a bit larger than what I’d like, measuring 81” long, 55” wide, and 76” high. A tad larger than the chair we discussed previously in #1. 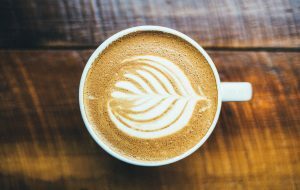 If you’re not already convinced, here’s 5 reasons to seriously consider investing in one of these bad boys! If you’re into summer sundowners, and sipping away as the sun sets, there is no better way to lounge than on one of these. 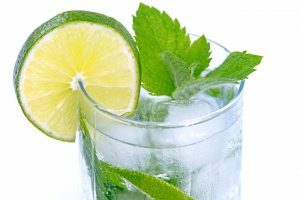 Fix up that honey mojito, grab your shades, lay back and drift away for the next half hour! Doesn’t even matter if you’re not into evening cocktails, who doesn’t love watching a beautiful sunset!? What in the world is brekkie? I’m so glad you asked. Breekie is aussie slang for breakfast. If you learnt anything from this entire post, let it be this! It may prove handy if you’re ever in the land down under. Nothing Like A Cup Of Coffee While Swinging Away! I digress but nothing better than an early morning cup of tea/coffee while lounging on my helicopter hammock chair and listening to the birds chirp. If you have breakfast indoors during summertime, you’re seriously missing out! And you’re being wasteful, so shame on you! Get out, put on some sun screen if you have to, and enjoy it while it lasts. Because it doesn’t last long. 4 months from today and we’ll be knee deep in snow! BBQ and summer go hand in hand, can’t have one without the other. That being said, have you ever noticed that the best BBQ parties are always those that have the best patio space? The folks who rock the coolest setup host the best BBQ parties that everyone wants to go to! 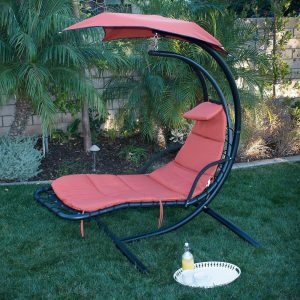 If summer get-togethers are your thing, a helicopter swing chair is one of the many awesome ways to spruce up your deck furniture! Far and beyond this was my #1 reason to get a helicopter swing chair! First off, afternoon naps are soo underrated. 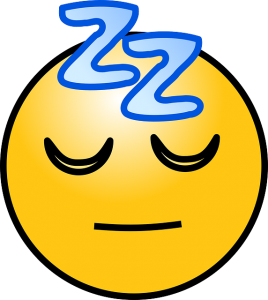 Did you know a quick 20-30 min afternoon nap can significantly boost your performance? Check out this article from treehugger that talks about the 7 benefits of an afternoon nap! Helicopter Hammock Chairs Are Awesome For Afternoon ZZZ’s! Lounging in the sun and catching some zzz’s has never been more comfortable, and that’s not even the best part. The best part is you get to do it all while you get your daily vitamin D uptake. Kill 2 birds with 1 stone? Heck yes! If you’re a bookworm and you know it, say aye! I sure as hell am. I do my reading all over the place. Sometimes I head over to a coffee shop, other times I check out the closest public library, and majority of the times I do my reading on the bus while on the way to work. But by far the most enjoyable and relaxing reading session I’ve had is on my helicopter swing chair! I can’t quite figure it out, but there’s something about reading outdoors when the sun’s out with a mild but pleasant breeze. Although a noisy neighbor or two could definitely ruin the experience! 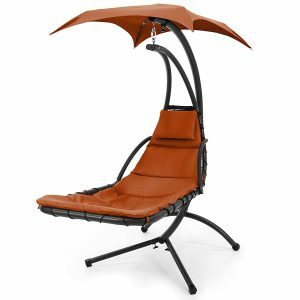 Earlier we spoke about the 2 best helicopter hammock chairs, and all the reasons to seriously consider buying one of these trendy, cool looking pieces of outdoor furniture. Now let’s look at some of the things you ought to consider before actually buying one of these bad boys! 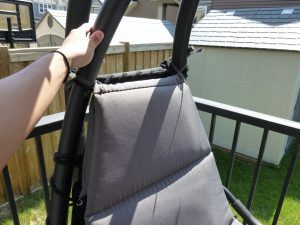 Weight Rating—Most helicopter hammock chairs are rated to about 120 kg. If you weigh significantly more than this, you may wish to consider a chair that has a higher weight rating. Overall Size—There’s only one way to find out if it will fit. Take note of dimensions, pull out your tape, and start measuring. Don’t take this for granted. Best to take some rough measurements than having to return a chair because it didn’t fit where you wanted! Removable Canopy—Not as important if you plan on leaving the chair outdoors. 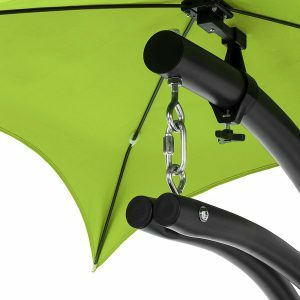 If you plan on leaving it indoor, check to see if the canopy/umbrella can be removed. Foam Padded Cushions—The thicker, the better…..obviously! The most I’ve seen is 2” foam thick cushions. Seems to be the go-by. If you can find more than 2” thick cushion, go for it! Is there any rust protection, and if so what kind? 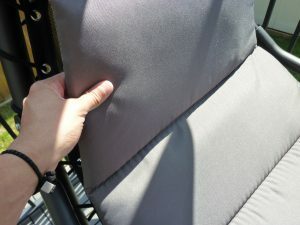 Most chairs have a powder coated layer. Is the cushion water resistant? What material is it made of? 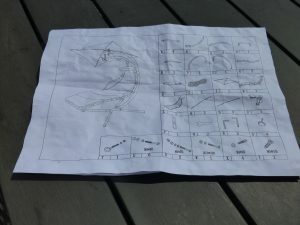 Assembly/Disassembly—How simple is it to assemble the chair from all its individual parts and pieces? And do you require any specialized tools to put it all together? If you can, read the instruction manual prior to purchase and pay special attention to the assembly instructions. So you’ve finally made the decision to invest in a helicopter hammock chair. Before we go any further, great choice. Patio time is never gonna be the same! That being said, there’s still a few things you’re gonna have to do from a maintenance and care perspective if you want your chair to last forever. Treat it poorly and it’s as good as trash. Treat it well, and it’ll last a lifetime! Let’s look at 5 simple tips to get you on your way! Today, most patio furniture is designed to be waterproof. That means you can leave it outside throughout the summer season and everything “should” be fine. While I agree with this approach, I also disagree to some extent. Allow me to explain. It’s one thing to leave the assembly and frame outside throughout the summer, but it’s another to leave the soft cushion. 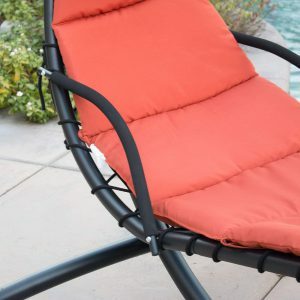 Even though most cushions are coated with water resistant PVC, I still never leave my patio furniture cushions out 24/7. Some might say I’m being a little fussy, but at least my cushions will be clean, dry, and soft to sit on when I need them! To do or not to do? Take my advice and follow suit! There’s a time and place for pigging out: it’s called lunch (dinner also! ), and it’s best done while properly seated on a table. Have some manners y’all! In all seriousness, save the greasy BBQ, and creamy desserts for the table, else you may have to clean up a nasty, sticky mess! A food spill on your helicopter hammock chair cushion won’t ruin it, it’s more so just added work to clean. If there’s one thing I despise, it’s cleanup, so I’ll do my best to avoid being in that situation to begin with. Tea and coffee is fine, because well….how can you not indulge in an early morning tea while watching the sunrise!? Sundowner cocktails are an exception as well. Sorry, I’m breaking the rules a teeny bit, but do ya honestly blame me!? The fact that i’m even saying this is actually pretty funny. You’d think it would be common sense…apparently not! Certain folk look at a swinging chair and immediately think of it as some sort of rocket contraption to launch themselves into the ether and beyond. Guys/Gals, calm down a second, put your thinking cap on and stop trying to see how far high you can get! Leave the rocket launching to NASA, my friends! Do yourself a favor, and retain all the packaging. If there are extra parts that were unused in the assembly, make sure you store these safely together with the original packaging. More importantly, store all of this stuff in some place you can remember! Why is this important? Having the original packaging with all parts and documentation could prove important in the event you need to return the chair. Most manufacturers are picky about this kinda thing, and will not accept a refund if parts are missing, or if the item is not sent back in its original packaging. Trust me when I say I’ve learnt this the hard way! Save All Packaging & Documentation! Helicopter hammock chairs are designed to seat one person at a time. This isn’t a 2 for 1 type of deal! Break this rule, and you risk wrecking the frame assembly. If you’re looking for a 2 or 3 seater, consider purchasing a traditional garden swing. What can you do to prevent rust formation? 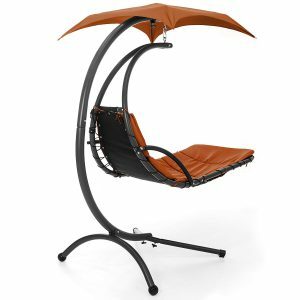 Most helicopter swing chairs all claim to have “rust resistant steel frames”, but is this really true? As much as I hate to say it, it kinda is true. There’s a difference between rust proof and rust resistant! By definition, something that is rust proof will not rust at all. On the contrary, something that is rust resistant can resist rust to a certain degree, but that doesn’t make it rust proof (Source: Answers.com). See the difference? So for all of you wondering why in the world your frame is rusting after a couple months, that’s why! It can only resist rust to a certain degree, and if that’s exceeded, best believe it will rust! That being said, how “rust resistant” are these chairs? I can’t speak for all, but the one I have was powder coated. This is good because it provides a protective layer preventing rust formation. But, here’s the thing: if that layer is compromised, then so is the protection from rust. Avoid Using A Pressure Wash—Doing so may result in paint peel, which you don’t want. Instead, douse the assembly in a low pressure soapy water mix. Wash the cushion separately of course! Apply A Rust Inhibitor—These can be found in your local home hardware type stores. There’s plenty to pick from, but I’ve found rust check works pretty well. Spray the rust inhibitor not just to the frame, but every piece of metal! Think About Placement—Think about where you’ll place the chair in your deck/patio. Ideally, it should be free from any obstructions. Remember, hitting against something can not only damage the frame, but also chip the paint and as discussed previously, and I don’t need to tell you what that can lead to! Helicopter lounge chairs are sold pretty much everywhere these days. I’ve even seen them sold in Walmart! The problem with buying offline is that it can get pretty expensive. Based on my research and experience, buying online seems to be cheaper with chairs more frequently going on sale. Having said that, I recommend you buy online if possible. 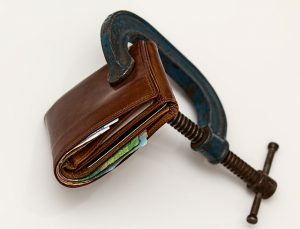 If you do decide to buy offline or in-store, do your due diligence and check if competing stores have a lower price. That way you can potentially ask for a price match and beat! You’ll have to contact the manufacturer directly should you require replacement parts. Irrespective, i’d always check with the manufacturer first before jumping the gun and buying parts online. If you’re fortunate, the manufacturer may consider sending for free if the chair is still under warranty. Don’t worry i’ll be going back to writing about massagers shortly, but I hope you enjoyed reading today’s post. If you did, please show your support by sharing on the socials. 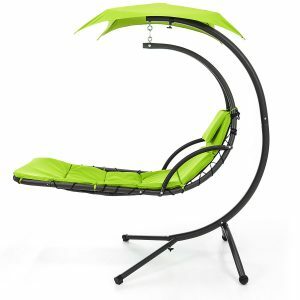 What’s your favorite thing about the helicopter hammock chair? Leave your comments and let’s get a discussion going! Also, feel free to let me know what you’d like to see next on massagersandmore!